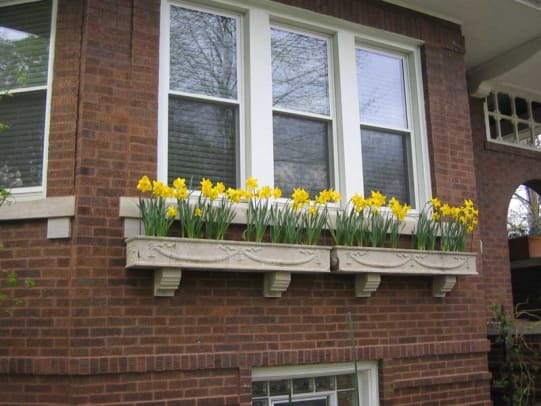 Bringing the window boxes back to Chicago&apos;s bungalows. Chicago is famous for its architecture—from gleaming skyscrapers to Oak Park’s Prairie School homes. Did you know that the region’s bungalows, too, are unique? About 100,000 brick bungalows (dating to after the great fire) were built between 1910 and 1940 in “the bungalow belt,” an arc sweeping from the city’s mid-section to outlying suburbs; bungalows make up over a third of the region’s modern housing stock. 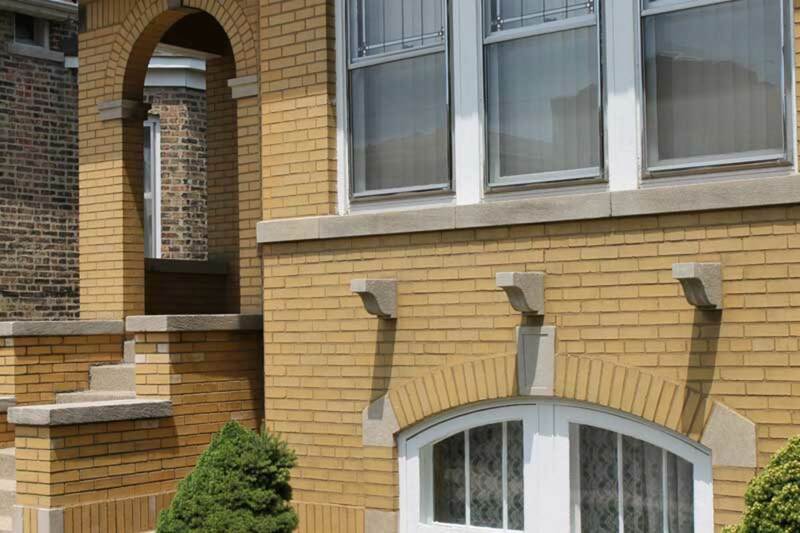 Set on Chicago’s long and narrow lots, the single-family, mostly working-class homes were solidly built of yellow or red brick with limestone accents. 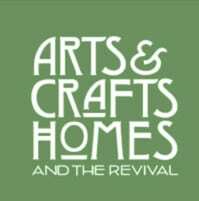 They were modern, up-to-date homes, always with front lawns and small gardens, which also embraced Arts & Crafts tenets. Masonry façades were laid with projecting stone corbels meant to hold a window box (which was optional). 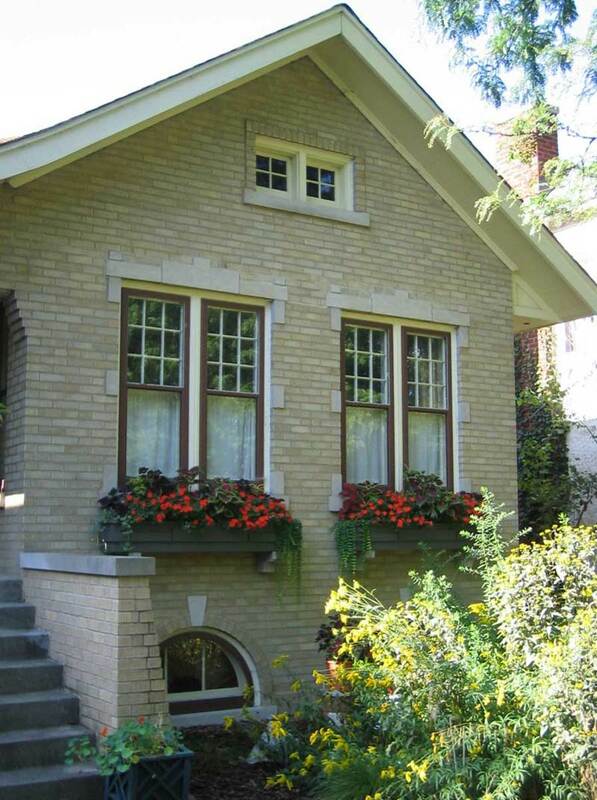 Chicago&apos;s brick bungalows were designed to include window boxes. Over time, the boxes were ditched as high-maintenance relics of a bygone era. 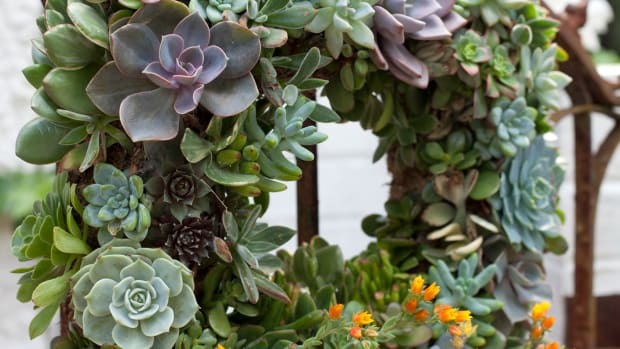 With the revival of bungalow living, planting window boxes and front-stoop urns has come back in a big way. The original box containers were made of unpainted cast stone or concrete, often detailed with geometric bands or scrolls. Replacing them in kind can get pricey—they cost $400 and up. A concrete box is appropriate (it blends in even when empty), develops patina, and is too heavy to steal. 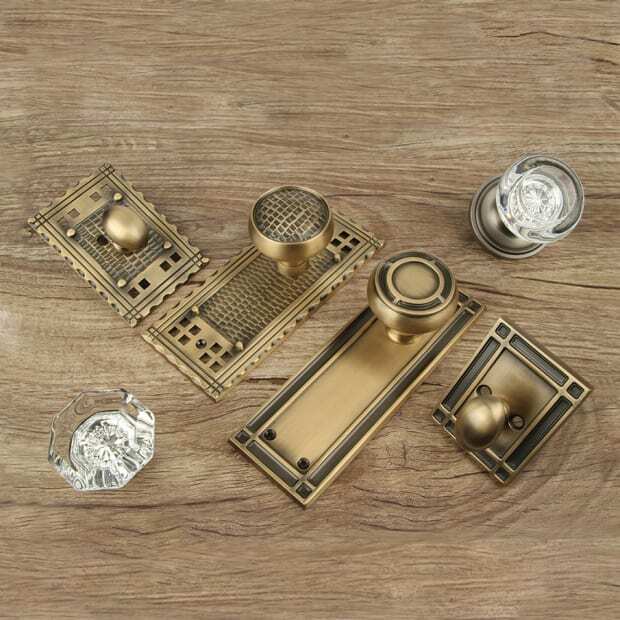 But drainage may not be adequate, you have fewer options for size, plants will need more frequent watering, and the box may crack during freeze-thaw cycles. 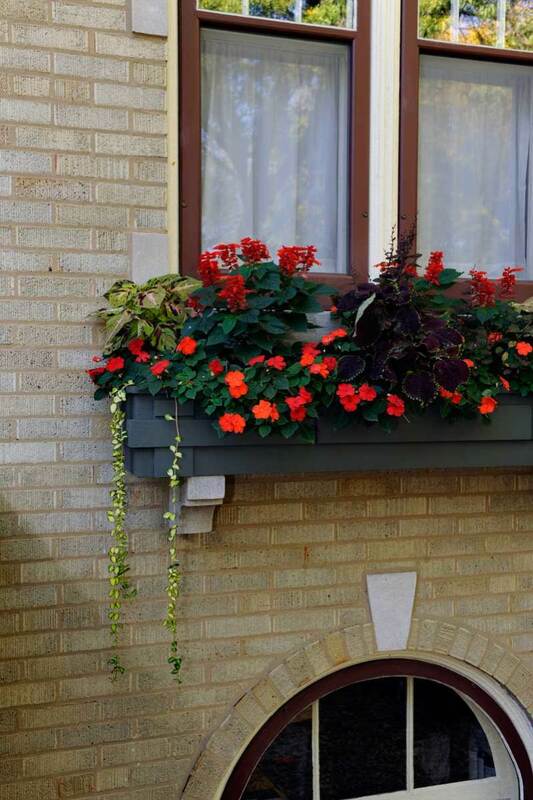 Many window boxes were ditched as high-maintenance relics of a bygone era. Wood, commonly cedar, is the most popular material today and easier on the budget ($50 and up). 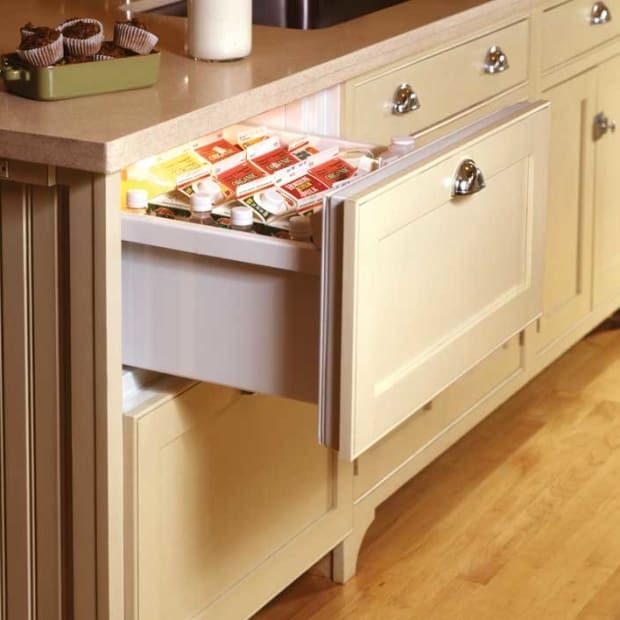 Design and color options abound, wood is easier to move, plants stay cooler and better drained. But wood does require refinishing every few years. Metal, fiberglass, and PVC planters are also sold today. These are very economical and can be painted. (Plastic must be kept painted to avoid fading and cracking.) Paint color may match window trim; or choose a neutral color that complements the masonry and doesn’t compete with the plants. Liners protect the wood and maintain moisture longer; a simple plastic box liner also makes planting easier. 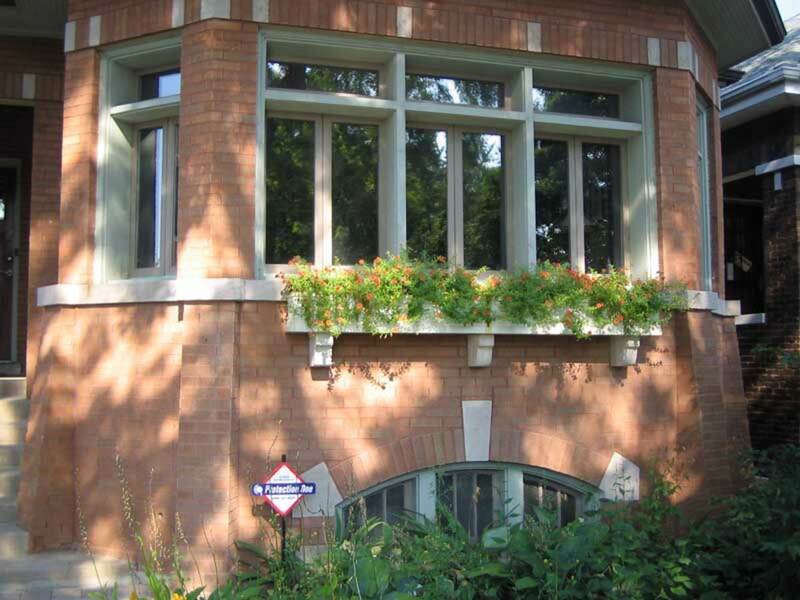 Replaced window boxes rest on corbels, softening the façade of a gable-front brick house with limestone accents. Size is critical for these boxes, which should extend several inches beyond the corbels, and rise approximately ¼ the height of short windows and 1⁄5 the height of tall windows. Measure the width of the window or group of windows, also the supports from outside edge to edge, and their depth front to back. Next measure the height from the top of the corbel to the lower edge of the sill; if the distance between sill and brackets is less than 10", also measure sill projection. You might make a cardboard cutout of the proposed box front, setting it on corbels to check size and proportion. A Prairie-style wood box rests on limesone corbels. If the corbels are still there, just set the box on them. Filled with soil, it should be heavy enough to stay put. For other houses, wooden brackets are appropriate and may be painted to match the siding or the box. 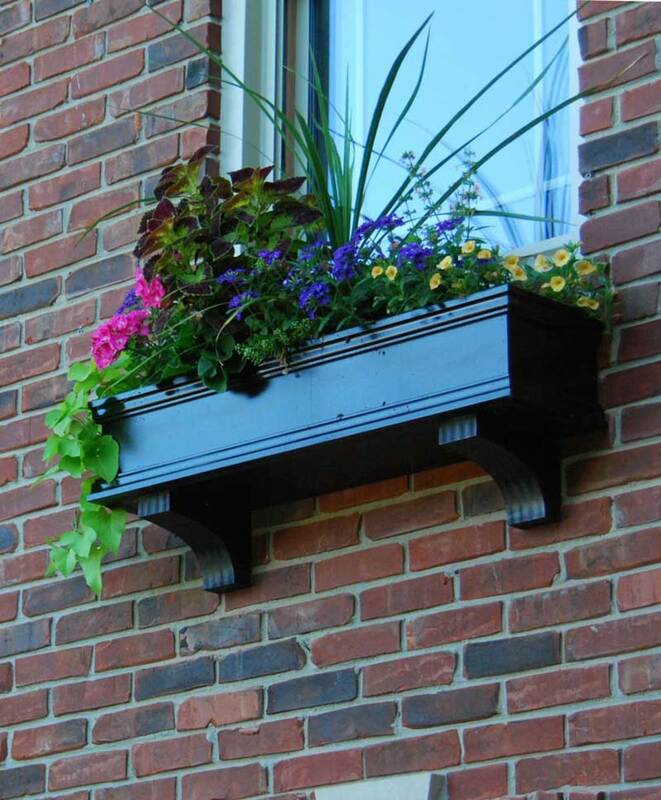 Cleats (interlocking brackets placed on the wall and the back of the window box) make an invisible hanging system. If there’s concern about the box shifting or falling, perhaps because of wind load or structural issues, do attach the back of the box to the masonry with lag bolts. 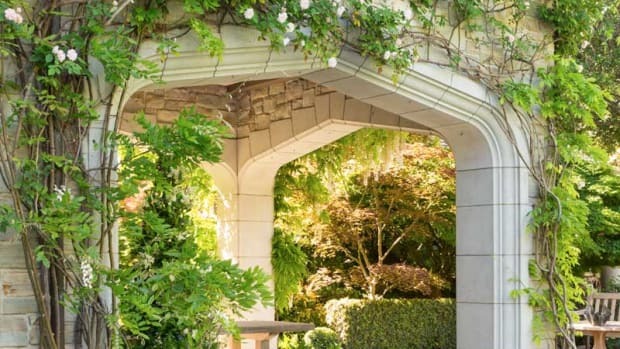 Separate boxes rest between buttresses in each bay of an octagon bungalow. Selecting plants is the fun part. Consider how many hours of full sun the box will get. Be honest about commitment: will you deadhead every day? Combine plants that offer height, low massing, and a vining or cascading habit. A wand with a ratcheting head allows even watering without damaging blooms. Self-watering systems (with hollow pipe to wick water) cut watering maintenance by a third, and take over when you go on vacation: Flower Window Boxes’ ‘Wickinator’ system comes highly recommended. 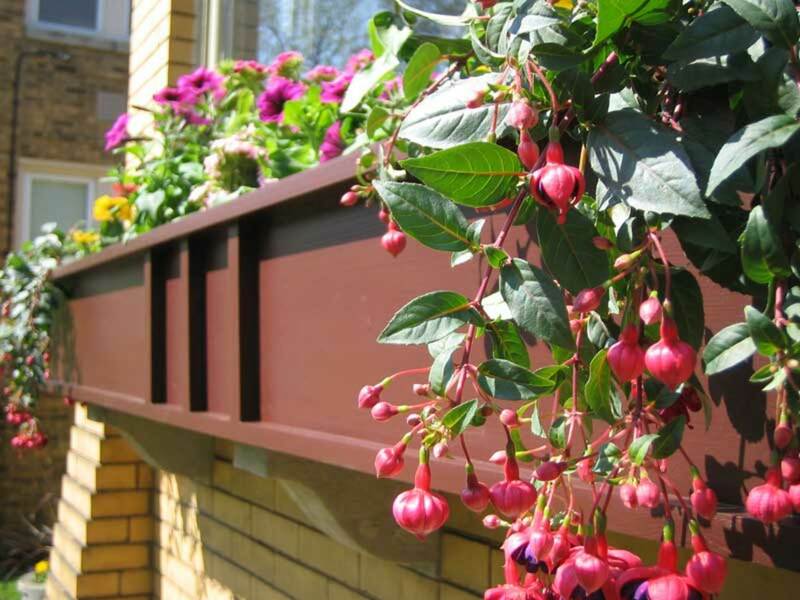 Flower Window Boxes offers this self-watering box. 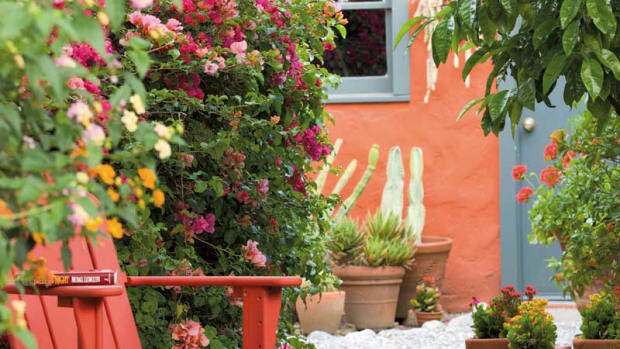 Plant expert Jackie Riffice says the best window boxes have a combination of annual and perennial plants to provide color and bloom longevity. Gardeners refer to container selections as “thrillers, fillers, and spillers.” Thrillers rise dramatically as focal points. Fillers soften the base and add fullness. Spillers cascade over the sides. Evenings are cool in Chicago (Zone 5) until June, so don’t plant too early. Use a clean, organic, mixed potting medium developed for containers. Loosen root balls; don’t plant too deep, but do crowd plants a bit for lushness in a short season. 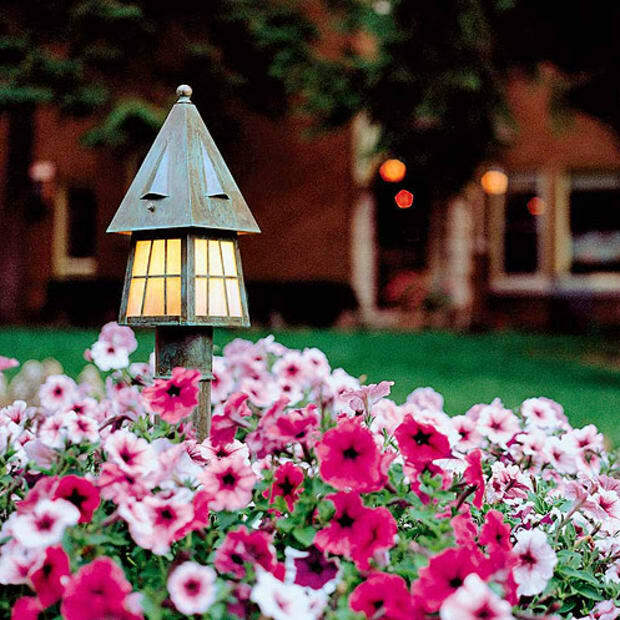 Many planters can be left out all year, so don’t limit yourself to a summer planting. 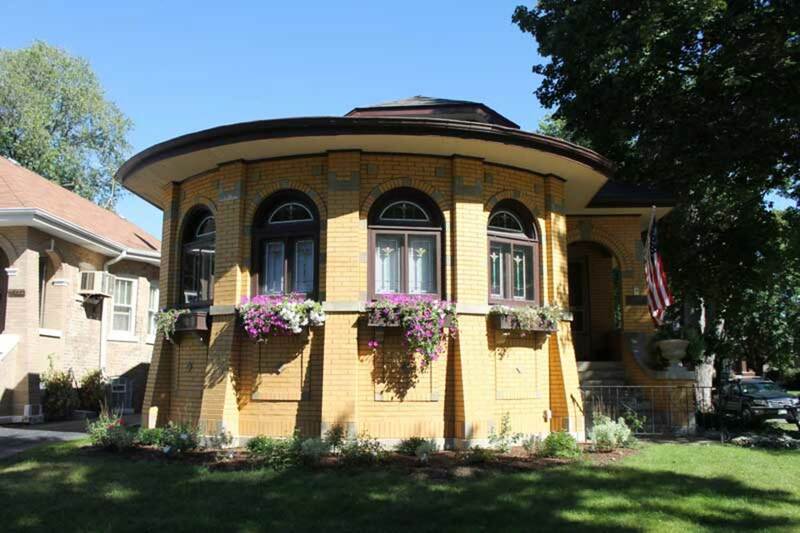 Our thanks to Chicago-area bungalow mavens Gillian Wiescher (Historic Chicago Bungalow Assn. ), Jofrid Stavig, and Jackie Riffice.